The first time Eudora starts, it will ask you if you wish to use the 'system keychain' to store your passwords safely. This will bring you to the 'Welcome to Eudora!' 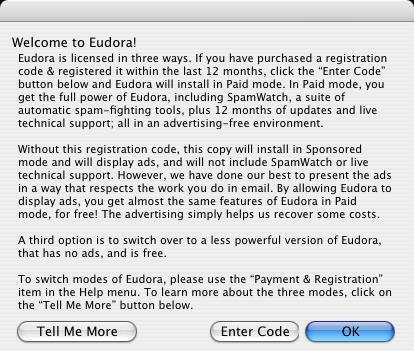 screen mentioning the type of licensing Eudora comes with. If you have purchased a licence, click the 'Enter Code' button and enter your licensing key, otherwise, click the 'OK' button to enter into 'Sponsored mode'. 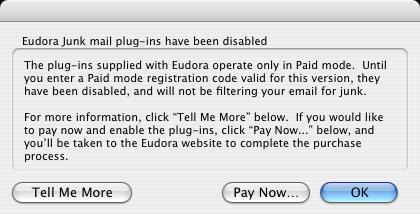 If you clicked on 'OK' in the last screen, the Eudora Junk mail plug-ins notification will let you know that the Junk mail plug-ins have been disabled. This next screen will ask you if you would like to import settings and mail from another application. If Eudora is not your default mail handler, this screen will pop up asking if you wish to set it as your default mail program. If this screen comes up, click 'Yes'. At this point it will open up the 'Settings' panel in the 'Getting Started' category. Once you have typed in those settings, click the 'OK' button. Eudora's 'Inbox' screen will show (sometimes it does not bring up the 'Inbox' so you need to go to the 'Mailbox' menu and then choose 'Inbox'). You should now be able to send and receive email. Click on 'Special' > 'Settings...' > 'Getting Started' category. 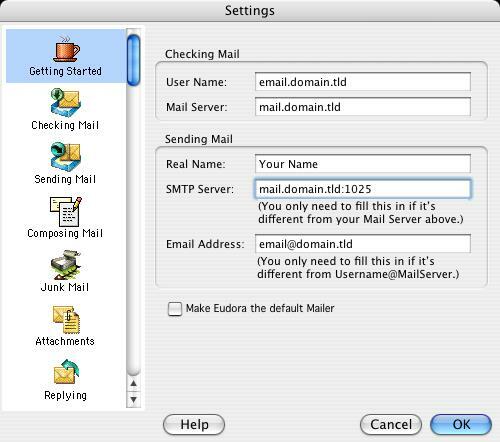 Change the 'SMTP Server' from 'mail.domain.tld' to 'mail.domain.tld:1025' (eg. mail.test.com:1025).